1 OWNER! CLEAN HISTORY REPORT! REAR BACK UP CAMERA! TOUCH SCREEN DISPLAY! PUSH BUTTON START! HEATED LEATHER AND SUEDE SEATING! DRIVER SIDE MEMORY SEAT! KEYLESS ENTRY! BLUETOOTH! GARAGE DOOR TRANSMITTER! Looking for a clean, well-cared for 2015 Ford Edge? This is it. 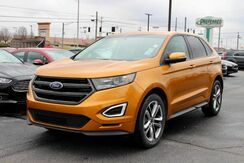 This Ford Edge Sport defines excellence in an SUV. It has the convenience of limitless boundaries paired with city sophistication. Today's luxury vehicle is not just about opulence. It's about a perfect balance of performance, comfort and attention to detail. This 2015 Ford Edge is the perfect example of the modern luxury. 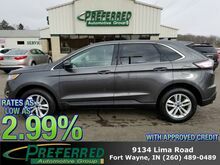 Navigate through all the icky weather with ease in this AWD-equipped Ford Edge, and even get non-stop traction for your non-stop lifestyle! In addition to the amazing traction control, you may even qualify for an insurance reduction with this AWD vehicle. Low, low mileage coupled with an exacting maintenance program make this vehicle a rare find. This model sets itself apart with strong safety feature set, stylish and refined, and Range of efficient powertrains.